A set of prints by Carlo and Giovanni Ottaviani reproducing the fresco decorations executed about 1610 by Guido Reni and assistants (probably Antonio Carracci and Alessandro Albani) in the Cappella dell’ Annunziata, the private chapel of the papal residence on the Quirinale. Set of engravings reproducing fresco decoration in the private chapel of the Papal residence on the Quirinale. folio, a series of thirteen engravings, struck on thirteen sheets of unwatermarked laid paper of varying dimensions (some edges untrimmed), the frescoes by Guido Reni and assistants drawn by Pietro Angeletti for the printmakers Carlo and Giovanni Ottaviani, who sign three and eight prints respectively (the two others are inscribed appo Ottaviani). The three largest plates dust-soiled along one edge, otherwise excellent impressions with broad margins and in perfect condition. binding contemporary paper wrappers (sewing renewed). A fine set of engravings reproducing fresco decorations executed about 1610 by Guido Reni and assistants (probably Antonio Carracci and Alessandro Albani) in the Cappella dell’Annunziata, the private chapel of the papal residence on the Quirinale. Two scenes from the Life of the Virgin painted in the lunettes, ‘Presentation of the Virgin in the Temple’ and ‘Annunciation to Joachim’, and some putti bearing scrolls and female figures representing the Virtues, then attributed to Guido Reni’s assistants, were not engraved; otherwise the whole cycle is copied. Altarpiece by Guido Reni in the private chapel of the papal residence on the Quirinale. subjects ■ [altarpiece: Annunciation] Maria Virgo Mater ab Angelo salutata (640 × 345 mm platemark, the sheet 800 × 540 mm), signed Guidus Reni pinxit. Petrus Angeletti del. Joan. Ottaviani Caroli iii Hispan. Regis Scalptor incid. ■ [over the altar: God in Glory, blessing] Antiquis Dierum (385 × 325 mm platemark, sheet 540 × 400 mm), engraved by Giovanni Ottaviani ■ [left of the main altar: Virgin sewing, accompanied by two angels] B. Virginis Matris occupatio domestica (390 × 325 mm platemark, sheet 540 × 400 mm), signed appo Ottaviani ■ [beside the main altar, four single figures from the Old Testament] Jacob, Abraham, Isaac, Adam (each 375 × 150 mm platemarks, sheets 540 × 400 mm), engraved by Giovanni Ottaviani ■ [over the entry: Birth of the Virgin] Nativitas Beatissimae Virginis Matris (565 × 465 mm platemark, sheet 800 × 540 mm), signed Carolus Ottaviani incid. 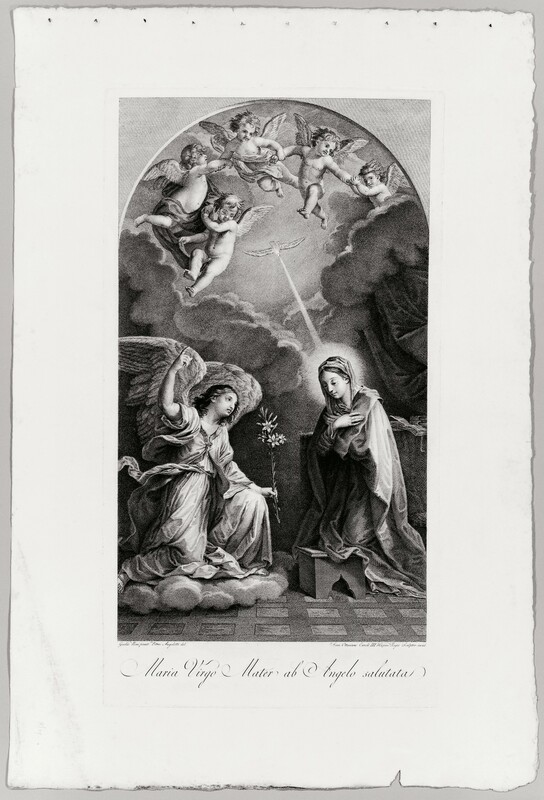 ■ [in the dome: Virgin in Glory] B. Virgo Mater in Caelum assumpta (420 × 495 mm platemark, sheet 540 × 800 mm), signed appo Ottaviani ■ [pendentives of the dome: Kings and Prophets of the Old Testament] Salomon Rex, David Rex, Moses, Isaias (395/400 × 330 mm platemarks, sheets 540 × 400 mm), the prints of Salomon and Moses engraved by Carlo Ottaviani, those of David and Isaias engraved by Giovanni Ottaviani. 1. D. Stephen Pepper, Guido Reni: a complete catalogue of his works (Oxford 1984), pp.224–225. 2. The Albertina’s impression of ‘The Virgin sewing’ (i.e. 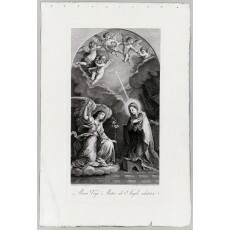 the Annunciation according to pseudo-Saint James) is in a state before the inscriptions present on our impression; see Veronika Birke, Guido Reni und der Reproduktionsstich, catalogue of an exhibition held in the Graphische Sammlung Albertina (Vienna 1988), no. 13. The Albertina’s impression of ‘Nativitas Beatissimae Virginis Matris’ was exhibited in Guido Reni und Europa, Schirn Kunsthalle (Frankfurt am Main 1988), pp.461–462, C–35. 3. ● Reggio Emilia, Biblioteca Panizzi, Gabinetto delle Stampe ‘Angelo Davoli’, Inventario 25798 (an impression of ‘Nativitas Beatissimae Virginis Matris’; online catalogue, image). 4. ● Rome, Bibliotheca Hertziana, Ca-REN 72-350 gr raro (Rara-Magazin) (digitised http://www.bildindex.de/obj08039378.html). The two additional plates called for on the title were engraved by Giovanni Battista Dasori. ● Rome, Istituto Nazionale per la Grafica, Inv. 727/1–15 (http://calcografica.ing.beniculturali.it qv. Episodi della vita della Vergine) ● Florence, Biblioteca nazionale centrale, Biblioteca Palatina, 4.B.8.4. 6. ● Florence, Kunsthistorishes Institut, J 8256 m (xiii Bl. Ill.; 2°; ‘vermisst / smarrito’); Mostra di Guido Reni, catalogue of an exhibition in the Palazzo dell’Archiginnasio, Bologna, 1 September–31 October 1954 (Bologna 1954), p.143.